I rode my bicycle to Dreier-Offerman Park (aka Calvert Vaux) this past Saturday. Artist Dillon de Give was performing a piece entitled "Hello, My Name is Dark-eyed Junco." According to the press release, the performance is "a response to the immanent installation of six artificial turf soccer fields scheduled to begin at Calvert Vaux Park November 24th. The renovation will significantly change the parkʼs natural habitat, which serves as a temporary and permanent home to a variety of birds". I wanted to support his effort, as well as, do some birding. It was easily the most brutal day of cycling that I've ever subjected myself. When I woke up, the reported windchill was 12 degrees and the wind was gusting to 32 mile per hour. There were chunks of ice forming in my water bottle. The cold alone wouldn't have been too bad, but fighting the wind was a little frustrating; sort of like walking up a down escalator. The open grassland of the park, as expected, was pretty much devoid of birds. The cove at the south side of the peninsula was in a windbreak, so there was a good mix of waterfowl present, as well as, a chatty Belted Kingfisher. Alex Wilson gave a tour to several die hard birders prior to Dillon's piece. I didn't stick around for the performance as I thought it wise to head back home before frostbite set in. Sunday the wind had died down and it warmed up to nearly 40 degrees...a virtual heat wave. 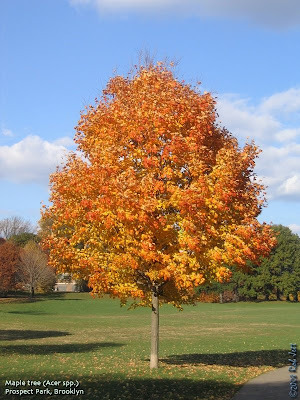 It was brightly sunny and flocks of hungry goldfinches descended on nearly every sweetgum tree in Prospect Park. I followed my usual route from the north end of the park towards Prospect Lake. Once on Wellhouse Drive, near the Peninsula Meadow, I ran into Gerry Layton and Rob Bates. They pointed out an Eastern Bluebird feeding on the opposite side of the road. It was an extraordinarily brilliant, blue bird. He was very cooperative, perching on low branches or vines, then dropping to the leaf litter at the edge of the road, presumably to grab insects. Then, in what struck me as a wonderful color theme, two other unlikely "blue" birds appeared in the same view - a Blue-headed Vireo and a Black-throated Blue Warbler. The vireo sometimes lingers late into the season, but the warbler just seemed bizarre. There are only six known winter records in New York State for this warbler. I hope he finds enough to eat, because if he doesn't hightail it down to the Bahamas soon, he might not survive the year. Also nearby was an Eastern Phoebe. November is usually the month for the unexpected and observing these, normally, warm weather species seemed to take some of the chill out of the air. Before leaving the edge of the lake Rob and I decided to look behind the Wellhouse for birds. We were standing there for only a moment when a Merlin flew out of the woods like a bullet. She headed right towards a pair of cardinals feeding in a Szechuan Peppercorn tree. The cardinals screamed a short alarm and the falcon took off flying towards lamppost J249. We weren't certain if the raptor was successful as she vanished into the trees. Thankfully, she missed the bluebird and "blue" birds. On my way out of the park, I spotted the pale-headed juvenile Red-tailed Hawk that I recently photographed in Green-Wood Cemetery. 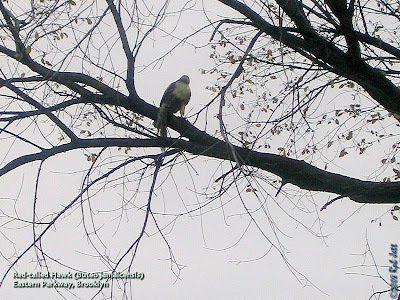 He was perched in a London Planetree at the 5th Street entrance to the park. He looked elegant and poised against the flame-orange setting sun. This morning (Monday), I saw the hawk again at the end of my block. He was chasing pigeons. Perhaps he is the red-tail that I've been catching glimpses of when eating my breakfast. A neighbor across the courtyard feeds pigeons and there is now a sizable flock that comes in every morning. About a week ago I started to notice a large raptor stirring up the flock. Hmmm, my new best friend for life. New Red-tail in Green-Wood Cemetery? On Wednesday I took a quick ride over to Green-Wood Cemetery ... and, "No", I didn't find the you-know-what. 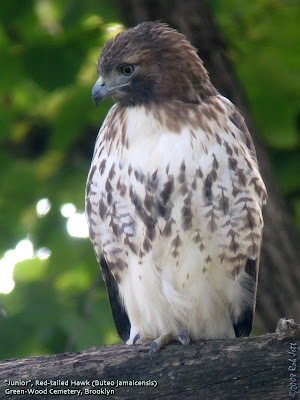 Marge and I did come across a juvenile Red-tailed Hawk that neither of us recognized. 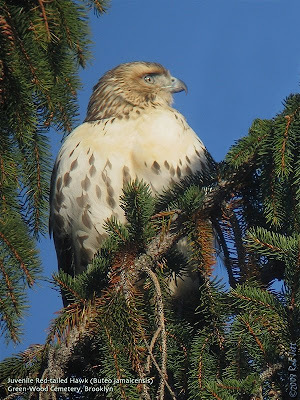 We spotted the young bird perched near the top of a pine tree on Ocean Avenue. He was a couple of feet below the top and almost hidden by the tree's needles. Like the adult named Ralph from Prospect Park, this bird had very pale head feathers. I looked through my photos of the four offspring from Green-Wood Cemetery and Prospect Park, but they all had the typical dark heads. As I took photos of the hawk, we noticed Big Mama her mate, Junior, soaring high above the cemetery. The young hawk saw them, as well, and nervously watched them from his discreet perch. Perhaps they had tried to chase him from their territory earlier in the day. I started to think about the year that Junior arrived in Prospect Park. He still had his youthful brown-banded tail feathers. Big Mama was in the process of building a new nest with her mate of three years, Split-tail. Junior decided to "help" and got into numerous fights with the older male hawk. Eventually, Split-tail split and Junior hooked up with Big Mama. The following year the pair moved their territory into the Green-Wood Cemetery. 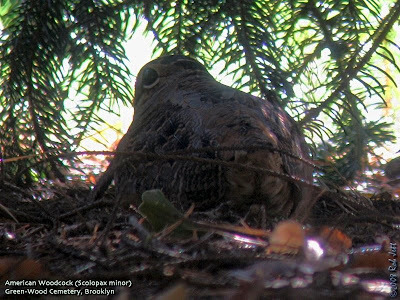 I wonder if this new, young bird in the cemetery is going to try and move in on Big Mama. Between riding laps around the park's outer roadway and the rain drops, I managed to do a little birding in Prospect Park last weekend. Most of the expected winter visitors have fallen into their daily routines; Northern Shovelers are swirling, face down in discrete circles on Prospect Lake; reclaiming a prime location, a pair of Bufflehead have returned and are diving at the Upper Pool, large flocks of twittering Dark-eyed Juncos are nervously feeding along the edges of the park's grass meadows and White-throated Sparrows are once again dominating the leaf litter of the woodlands. There were a few, fleeting moments on Saturday when the sun broke through the clouds. 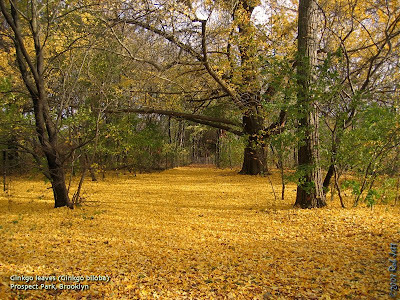 I was on the Peninsula at one point and a blanket of golden leaves beneath the Ginkgo trees were blinding bright. ILSA IS BACK! Hopefully, she will be around tomorrow and the next day and the next day... For those of you who haven't met her, she is a selasphorus hummer (possibly the same bird that visited us two years ago). First seen at 9:45am this morning and has been visiting the pineapple sage and the feeders every ten minutes. She will receive visitors at 21 Woodhull Place, Northport (red house fronted by three large evergreens). If she decides to accept our hospitality tomorrow and into the future, I will continue to post. " Here's looking at you, kid!" "Ilsa" wasted no time getting to her private commisary this morning; and I do believe that she is here for the long haul. 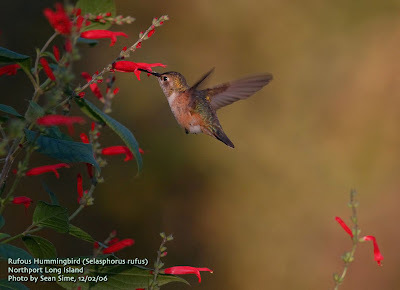 A little history: On the morning of November 26, 2006 a selasphorus hummingbird which we named Ilsa (more about this name at some future date) made her first appearance at our backyard. She left on January 29, 2007. In those 65 days we got to know our miniscule guest intimately. It was later concluded that she was indeed a rufous hummingbird. And she had journeyed 3000 miles just to visit our hummerble Northport backyard. Skip to the present; precisely 9:45am yesterday November 9, 2008, and who pops in but another selasphorus guest. We like to believe that she is original "Ilsa" and not some "Ilsa II." What are the odds that two different Ilsas would make that crazy journey and exit in the same little patch of Kleinville? So we think of her as original "Ilsa". But wbere was she hanging out last year? A mystery! If some are thinking that she is "Ilsa II", then this is a spectacular coincidence. I don't know how to solve this enigma. The future calls for her being banded; and then if she returns, we'll know for sure. "Ilsa" appeared this morning between 8 and 9 am, but unfortunately has not been seen since. I hope that she found some safe and food plenty place to spend the day. Perhaps she will reappear tomorrow, or/and the next day, or/and the days after that. I will keep the welcome mat out for her (fresh mix in the feeders) and the blooming pineapple sage. And I will keep the feeders going through Christmas. Also, I will continue to post for the rest of this week. 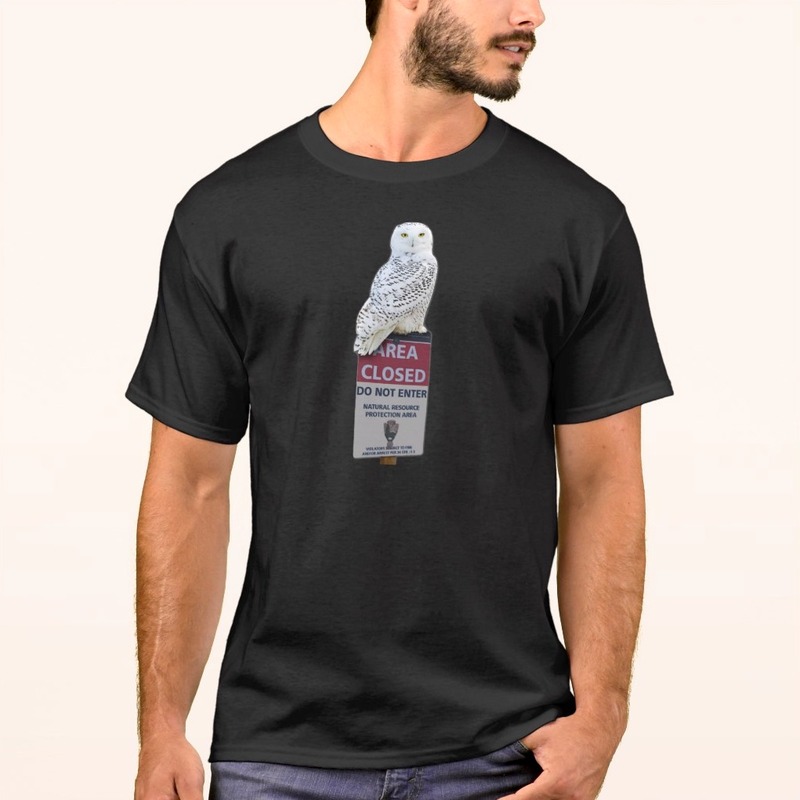 One of the disappointed birders who came by asked about the name "Ilsa", and since I promised to satisfy the curiosity of those who were not in the know before, I will only give you a clue. The day 2006 "Ilsa" appeared, I laughingly said to my wife: "Of all the gin joints in all the towns in all the world she walks into mine." And now you dear reader can fill in the dots. And I'd like to end with a toast to 2008 "Ilsa": "Here's looking at you, kid!" Ilsa was a no-show today. I am glad that some of you got to see the bird; and I feel kind of sad that some of you made the trip to Northport and were disappointed. 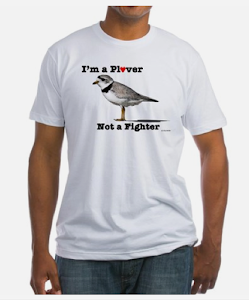 But that's one of the kickers of birding. I keep on hoping that she will return; and so I keep the feeders going. I will continue to post the rest of this week. There was some excitement yesterday as a sharp-shinned hawk dwelt around the other feeders and froze all the locals. Also, a purple finch and a pair of siskins and a fish crow made an appearance. So all was not lost. It was also good to meet old friends and some new ones and to be reminded what a hardy and persistent group are birders. Happy birding! No good news to report about Ilsa today; but the weather might have something to do with it. Even Tom Burke is hopefuil that a cold front might possibly bring her back. Keep the faith! So, Ilsa, the selasphorus hummingbird, has flown off one more time after only a two day+ stay; and sadly this is probably my last posting about her. I wish her well. As was said by a sentimental Rick: "We'll always have Paris." (Deep breath) Now that my computer has a shiny, new harddrive and all my files have been restored, here's the condensed version of what I've been seeing around the neighborhood. 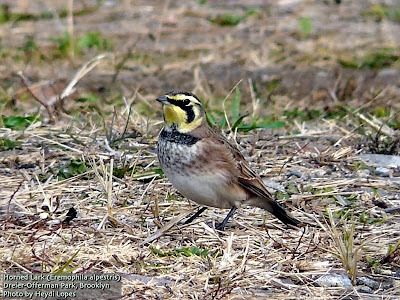 First, a big "Thank you" to Heydi Lopes for sending me a photo of a Horned Lark that dropped into Dreier-Offerman Park on November 1st. I saw Heydi at the park prior to finding the lark that morning. She was still nearby, so I hopped on my bike and tracked her down to let her know about this special bird. Luckily, it stuck around and she was able to take some really good photos. It seems like whenever I make a concerted effort to find the Great Horned Owl, I never find it. When I'm not looking, its glaring, golden eyes home in on me like lasers from a roost somewhere above my head. Unfortunately, the former was the case when I went hunting for him with Paige recently in the cemetery. The tremendous number of migrating Chipping Sparrows seen recently at Green-Wood were greatly reduced, but Hermit Thrush numbers have gone way up. One consolation prize was finding a woodcock. Usually, I find them by accidentally flushing them. After a split-second view, I never see them again. This time Paige relocated the well camouflaged bird sitting under the drooping branches of a pine tree. He kept one eye on us, but remained motionless in the tree's shadow. As we were walking up Central Avenue, back towards the main entrance, one of the resident Red-tailed Hawks swooped in and perched in a tree close to us. It was a small male and, judging by unusual dark smudges on his face, I was pretty certain that it was Big Mama's mate "Junior". He had his eye on something on the ground and eventually took off from his perch to a spot several yards from where we were watching. He wasn't successful catching his prey, but it was nice to get close looks of him hunting. 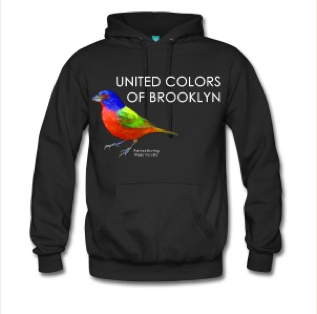 I was heading towards the subway when I received a call from fellow birder Edith Gorum. Her conversation was an odd "telephone game" situation. A guy on Eastern Parkway, near Washington Avenue, called Anne Lazarus at the New York City Audubon Society office. He found a hawk on the sidewalk near the Brooklyn Museum that appeared to be injured. Anne knew that I lived close to the museum, but didn't have my cellphone number, so she called Edith, who did. Edith explained the situation and wanted to give me the guy's number. I told her to just have him call me. A few minutes later I spoke to him and said that the best thing to do was stay put and call Bobby Horvath, a wildlife rehabilitator. In the meantime, I grabbed my bicycle and rode the short distance to Washington Avenue and Eastern Parkway. There wasn't much I would be able to do, but if the caller needed to like, I figure I would stay until help arrived. Now I feel like I should be saying something like, "I'm not an actual doctor, but I play one on TV". It's great that many New Yorker show so much concern and compassion for wildlife and over the next week I'll create a link in the sidebar for what people should do if they find an injured animal. For now, though, a call to the city's 311 line should be a good start. Anyway, when I arrived, the guy (sorry, I forgot your name) was walking around with an empty cardboard box, scanning the trees. Apparently, the hawk took off . I explained about how hawks will "mantle" over their prey and perhaps he encountered the raptor moments after he had made a kill. Our city hawks won't usually take-off and leave their prey behind, even if people are very close. The good news was that the animal was not injured. I was curious about the bird and scanned the trees for a minute before I noticed a community garden a short distant from where the hawk was originally seen. Good place for a hawk, I thought. 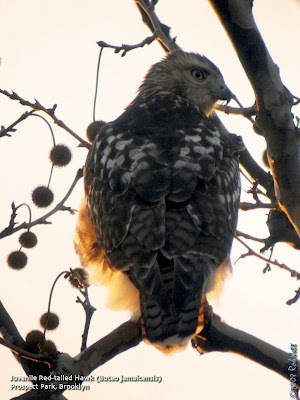 Sure enough, there was a juvenile Red-tailed Hawk perched in a large tree inside the garden. He had a very fat (and very dead) squirrel in his talons. The young hawk seemed awkward and unbalanced as he tried to get into a good position to eat his breakfast. Two days later, I was walking down 9th Street to the "R" train station. Perched on an antenna atop a Brownstone between 6th and 7th Avenue was an adult Red-tailed Hawk. I love spotting hawks in unexpected places. 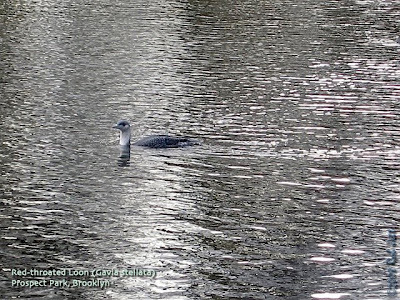 It was overcast and I didn't have any bins with me, but the pale-headed bird looked like Prospect Park's "Ralph". I pointed him out to a couple walking down 9th Street. Their faces lit up and they were still watching after I walked away. Last week I led a trip to Mt. 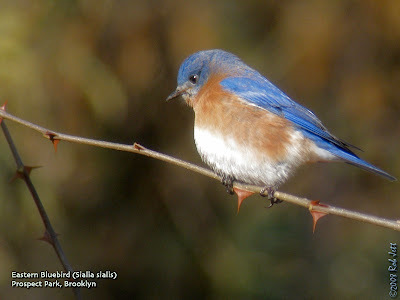 Loretto on Staten Island for the Brooklyn Bird Club. The weather forecasts called for rain and lots of it. I began the trip at 6:30am figuring we would be able to get in a few hours before the thunderstorms hit. I enjoy foggy weather, but apparently the birds at Mt. Loretto do not as there was very little activity. One highlight was spotting a male Merlin perched in a dead tree overlooking the south-most meadow. The tiny falcon was very cooperative and permitted long, studied looks. Eventually, a large Cooper's Hawk flew in from the north and out over the fields. It was a very hefty bird and probably weighed three times as much as the Merlin. Those kind of odds don't seem to matter much to the feisty little falcons. 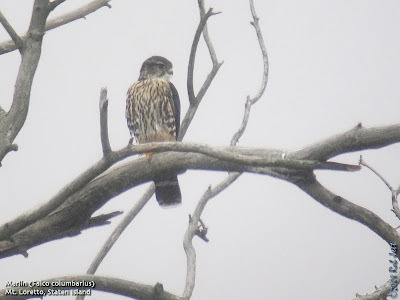 When the Cooper's Hawk disappeared over the trees behind the Merlin, he took off after her. I guess their pluck comes from the fact that they are very fast, agile birds of prey, and know it. I've seen one chase after a Red-tailed Hawk ... we're talking several ounces versus possibly a few pounds! We didn't find many birds at Mt. Loretto, so I decided to bring the group over to Conference House Park, which is just a short drive down Hylan Blvd. Again, birds were few and far between. The only highlight was a brief look at an adult male Northern Harrier. The grey ghost was flying across the Arthur Kill from Perth Amboy to Staten Island. If I had to guess, I'd say that this grassland specialist was heading towards Mt. Loretto. By the time we finished our lunch, the rain had begun. After a brief stop at Great Kills, where the drenching rain commenced, I decided to call it a day. It might be alright for me to walk around in the pouring rain, but I wouldn't subject a group of people to my silliness. 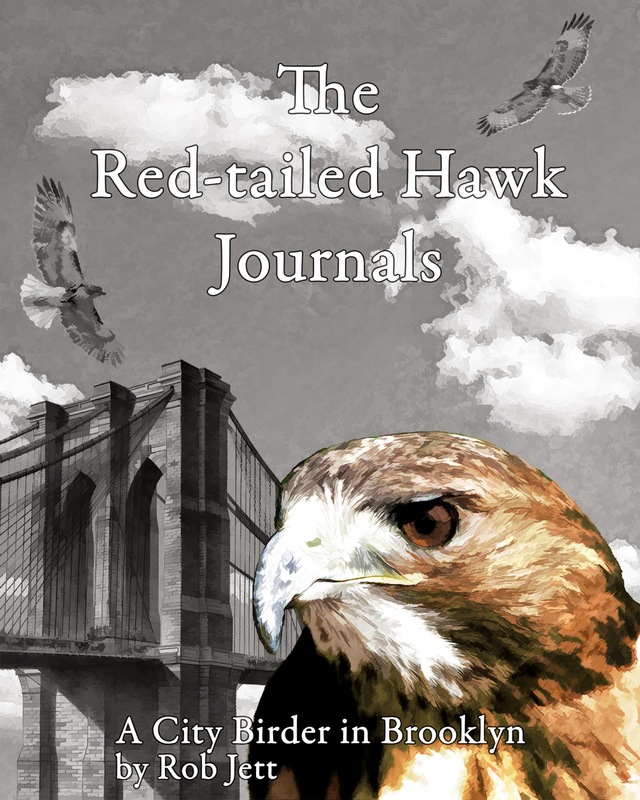 We were on highway after crossing the bridge into Brooklyn when I noticed a Red-tailed Hawk perched on a street light. The hawk was on the overpass at Bay Ridge Parkway. I checked the map when I got home. The location is adjacent to McKinley Park, a spot where my friend Big Dave has been seeing a juvenile Red-tailed Hawk for about a year and a half. The storms moved out of NYC overnight and Sunday I woke up to crisp, clear Autumn sunshine. I was hoping to wrap up my physical therapy during the coming week and a long bike ride would be a good test of my recovery. I decided to head out to Floyd Bennett Field for some exercise and birding. It's 9 miles from my front door to the entrance of Floyd Bennett Field. Add to several miles of riding inside the property, and it would be about a 25 mile day. If my shoulder held up, I would be ready to continue my recovery without a physical therapist. My shoulder felt fine on the ride down. It was around 50 degrees with a west breeze blowing against my right side for most of the route. Once inside Floyd Bennett Field I rode to the cricket field, then headed to the "Return a Gift Pond", followed by a short stretch through the North 40. At one point I heard the buzzy calls of a Pine Siskin flock. The nervous flock approached from the direction of runway 6-24 and touched down briefly in an Ailanthus tree. I exited the North 40, rode north along the old runway and turned right onto 1-19. From there I coasted along the edge of fields "G" and "C", scanning for grassland birds. Near the edge of Field "C" I spotted the brilliant yellow underside of an Eastern Meadowlark. I fumbled to get my camera out and the nervous bird took off. It was followed by 15 more meadowlarks. When near the ground, Eastern Meadowlarks have an odd, stuttering flight pattern that looks like it would be very inefficient for distance travel. Do you think that they fly differently at higher altitudes during migration? I tried to find a video of meadowlarks flying, but came up empty. Perhaps I'll shoot one myself some day. I my way out of Floyd Bennett Field I circled around the road behind the tree nursery. I found this Eastern Garter Snake warming up in the sun on the road. He looked very content and I hated to disturb the little one, but was afraid that he'd get run over by a car. 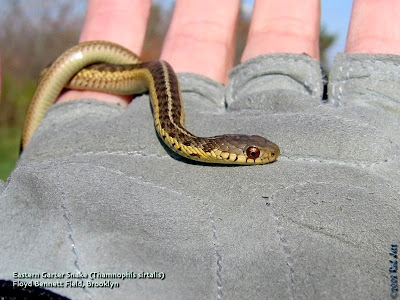 It was the first time that I've ever found a native snake species within the five boroughs of New York City. When I picked him up, he quickly wrapped around my little finger. I am organizing an audience-interactive birdwatching theatre piece at Dreier-Offerman on Saturday November 22 to help call attention to what is happening. I would love to have some involvement from the birdwatching community! In the immortal words of Gilda Radner's character Roseanne Roseannadanna, "It's always something!" 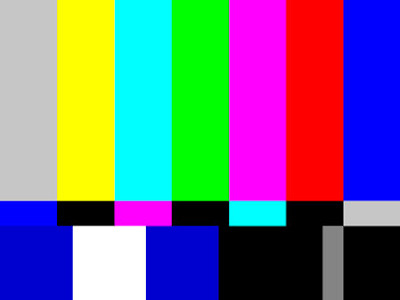 This time it's a technical glitch. My computer's internal harddrive bit the dust last week. Not to worry, all my files are backed up to an external drive and tomorrow a replacement should be arriving by FedEx. If all goes as expected, it should be pretty quick to install and restore my documents. Once I'm back up and running I have some Red-tailed Hawk stories from last week, a trip I lead for the Brooklyn Bird Club to Staten Island (Mt. Loretto and Conference House Park) and a day of cycling and birding at Floyd Bennett Field. Thanks for your patience. I decided to try something new to make the pages a little easier on the eyes. Since my posts can sometimes run a little long, I'm experimenting with "expandable post summaries". Let me know if you have any problems with your browser displaying the new expand/collapse feature. 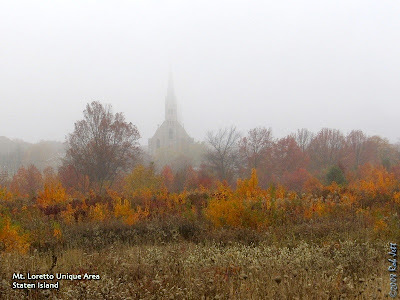 On Saturday I cycled to Dreier-Offerman Park and spent several hours birding the grassland and surrounding area. An early surprise (at least for me) was finding a Horned Lark feeding at the edge of one of the parking lots. During the course of the morning there were several flyovers of American Pipits. I observed two pipits feeding in the grass at one soccer field, but a flock of about 60 touched down very briefly. There were lots of sparrows around, the highlight being a Vesper Sparrow. Like every other time I've visited the park, I spotted at least one kestrel hunting over the grasslands. Beginning on Nov. 24, 2008, a large portion of Calvert Vaux/Dreier Offerman Park will be ripped up for the installation of artificial turf soccer fields. Ultimately, a vast area of the park will be covered with six artificial turf soccer fields. There have been no studies on the cumulative impacts of the fields on the existing bird populations. Nor has any info been provided on the cumulative temperature impacts of installing so much plastic in so concentrated an area. The existing natural turf playing fields provide foraging area for a variety of birds and it would be a crime to lose them. So far, our pleas to the Parks Dept. are falling on deaf ears. We're going to need a huge outcry from the birding community to protect the birds that use this park. "The Treaty, a partnership among The U.S. Fish and Wildlife Service (Service), New York City Parks and Recreation, Audubon New York and New York City Audubon, is a commitment to restore, conserve and protect valuable bird habitat within New York City’s urban environment and to develop an informed public through education and training programs." I guess that the parks department was just giving lip-service with that announcement, especially considering that the city owned grassland and next to non-existent and they are replacing natural turf with plastic turf at an alarming rate. If you are as outraged by this development as I am and would like to help, you can contact Ida Sanoff at the Natural Resources Protective Association. You can also contact the US Fish & Wildlife Service, Atlantic Coast Joint Venture. Mitch Hartley is the North Atlantic Coordinator. 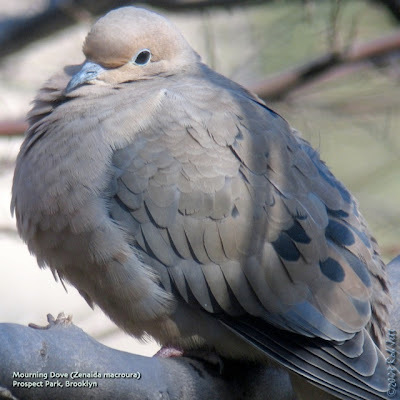 Click here to see a species list from Cornell's Ebird website.